I think it’s a walrus. All I know is it likes me and Stormi’s looking spooky in the background there. 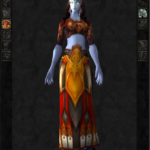 Ok, so I’m trying to find a different work around to go with the Paladin T2 Judgement Legplates & the Conqueror’s Aegis Tunic seems to line up perfectly there with the pants. The yellow in the front matches & the red in the back line up. This happened to Stormi on Jan. 5, 2013. 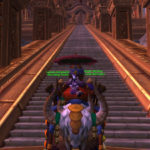 She bought this mount with a little help. The second picture is of my Paladin Dorathea on the Grand Expedition Yak in front of Mogu’Shan Vaults. 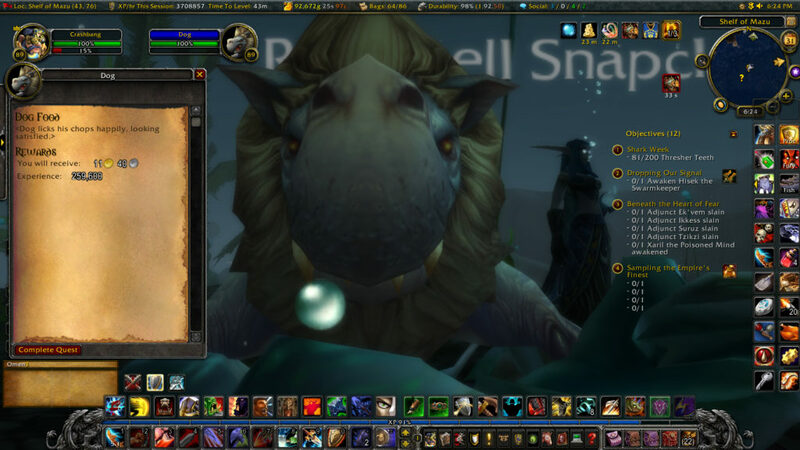 While searching for Battle pets, I found out that these eagles are a tough catch sometimes. You see the paw on your mini map, go to see where it is, but you better look up for anything that can fly. By the way, you can’t fight them while they are in a tree. Ground is not level enough to battle, is the message you get. So …., this happened on Jan 9, 2013 & yeah, I tree tanked it! 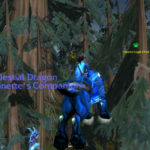 I have been soloing this place for a while & yeah, who gets the mount? My Resto Druid does.